The lack of Scottish players in the British and Irish Lions squad to tour New Zealand this summer has been criticised by former coach Jim Telfer. Full-back Stuart Hogg and wing Tommy Seymour are the only Scotland players in Warren Gatland's 41-man squad. "There's nine back-row forwards and not one Scot? There must be something wrong there," Telfer, who led the 1983 tour to New Zealand, told BBC Scotland. "Scottish rugby should really feel as if they've been badly let down." Gatland has chosen 16 England players, 12 from Wales and 11 from Ireland for the tour that runs from 3 June to 8 July, featuring three Tests against the All Blacks, who are world champions. 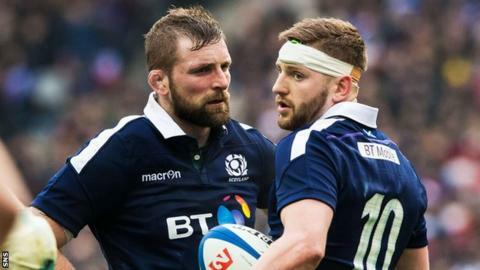 Scotland finished fourth, above Wales, in this season's Six Nations and Telfer thought Hamish Watson and John Barclay were unlucky to miss out. "I'm very, very disappointed considering there's 41 players there and we haven't got one forward out of the 22 or whatever it is forwards," said the Scot. "The fact that we won three games and we beat Ireland and Wales. It's not good for Scottish rugby at all. "Watson, Barclay are obviously candidates who should've been given consideration, so I am a wee bit angry because it doesn't represent British rugby. "Forty or 39 of the players, I agree with. They're very good players and somebody has to lose out and I'm not against that at all. "If he wanted to have some exciting new players, Finn Russell would've been right up there, but he's gone for the tried and tested. I think there's more creative players that could've been there and he hasn't chosen them." Former Scotland player Gregor Townsend, who will leave Glasgow Warriors in the summer to replace New Zealander Vern Cotter as Scotland head coach, turned down the chance to be involved in the Lions tour. And Telfer feels Gatland should have had someone involved to represent Scotland. "Vern Cotter could've been part of his coaching squad - he hasn't asked him," said Telfer. Telfer says Scotland have "the most creative set of backs"
"He's not actually doing all that much during the summer. Gregor, in my opinion, was right not to go because he's taking the Scottish team for the first time. "He should've got somebody on that selection committee from Scotland. He didn't need to be a coach, or a coach on the tour, but there's bound to be people who could've represented Scotland on that selection committee." Telfer coached Scotland in the 1980s and 90s, led the 1983 Lions tour of New Zealand and was also involved in the 1997 tour of South Africa. "I don't think it'll hold us back," he said of Scotland. "It won't really affect how Scotland play in the future and we can look to the future with with a fair amount of optimism. "We have the most creative set of backs in the British Isles and he's ignored some of them."